The fresh modern vibe that we bring to our events. We use turntables to DJ creating an upbeat, modern, live action vibe for today’s hip weddings and events! We are a husband and wife team! When you book The Beat Booth you always get a DJ/MC and an assistant/music coordinator. Nathan DJ's and Mc's your event while Erica coordinates and makes sure everything flows smoothly the day of. We have over 10 years of experience in event planning, promotion and DJ-ing. We pioneered VJ-ing in Arizona. This is where we DJ with music videos during your dance party. It creates a high energy vibe and gets your dance floor alive and jumping! We DJ weddings with or without music videos, whatever fits your style best. We know how important lighting is to create a polished image at your event. With this in mind we provide all necessary lighting to accommodate your vision. Currently we are rated 5 out of 5 on every single site that list us. 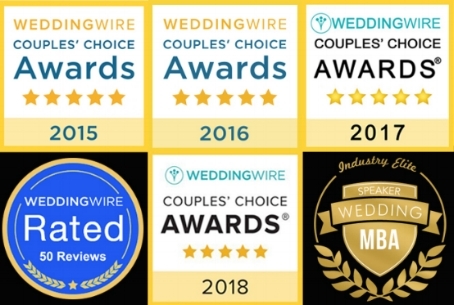 Yelp, The Knot, WeddingWire, EventWire, etc.